This example shows you how to use XCP blocks to directly acquire measurement values from a slave in Simulink®. It uses a freely available XCP slave simulator from Vector and Vector virtual CAN channels. For access to virtual channels, Vector device drivers must be installed. 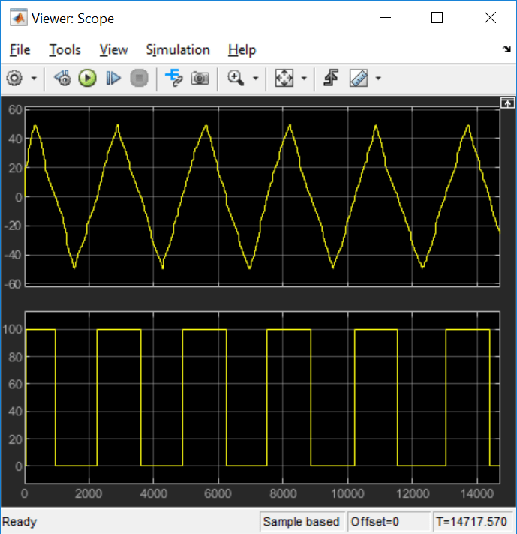 Vehicle Network Toolbox™ provides Simulink blocks for acquiring measurement values from a slave via Simulink models over Controller Area Networks (CAN). This example uses the XCP Configuration, XCP Data Acquisition, and XCP CAN Transport Layer blocks to perform data transfer over a CAN bus. 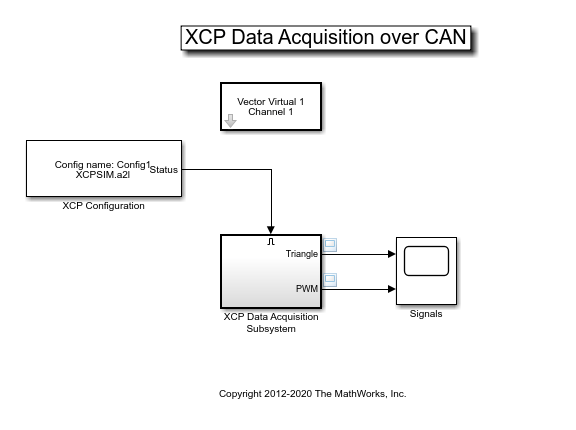 Create a model to set up XCP data acquisition for the measurements, Triangle and PWM, from the slave. Use an XCP CAN Transport Layer block and set the Device to Vector Virtual Channel 1. The transport layer is configured to transfer XCP messages over CAN via the specified virtual channel. Use XCP Data Acquisition blocks to receive selected measurements at specified events. 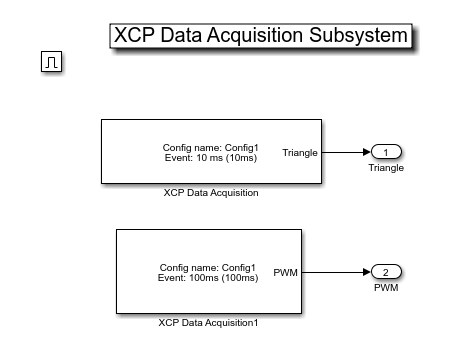 For this example we have selected an XCP Data Acquisition block for each measurement of each selected event. Plot the results to see the measurement values for Triangle and PWM from the slave. The X-axis corresponds to the simulation timestep.